Pablo Hermoso de Mendoza exemplifies the level of horsemanship originally imported to the New World via the Spanish Colonials. The popularity of Buckaroo-manship makes the origin of the Spanish-American bridle horse worth revisiting. The Californio “vaquero”-crafted bridle horse became the New World / Spanish-Colonial descendent of the historic Romanic working equitation horse of Iberia, a product of the doma vaquera (working) and tauromachia (bullfighting) schools of equitation still very much alive in Spain and Portugal today. The principles, methods, and objectives of this horsemanship differ from Newcastle’s only in terms of emphasis and venue – the platform, and the rationale of its origin, are the same. Both schools dress a classically finished horse, ridden in pervasive collection with one hand only – and with one bit only (the curb, which, in classical texts, is what the word “bit” implies, versus the bridoon, which means a snaffle). Portugal, of course, predates the United States, but also essentially every other European nation. One has to respect that. And one can do so by understanding the American ‘bridle horse’ is not to be confused with the more prevalent, woefully regressed, and more generalized “Western” style of equitation more popularly exhibited in the US today, which, by comparison, might be considered “trail riding near cows”. Portugal emerges within Iberia by 1150; the rest of modern Europe will develop hereafter. The horse is already a highly developed, effective weapons platform. Whereas the ancient Iberia-borne disciplines of Tauromachia and Doma Vaquera do fall within the realm of high school equitation, even the most legitimate and nuanced derivatives of our New World stock equitation (i.e., ‘Reining’) really don’t begin to approach it (nor does most of what passes for “Dressage”, but that’s a different article). This most obvious visual distinction is the absence of ‘artificial carriage’ (Note to the politically correct: having used the term ‘artificial’, I should point out ‘artificial carriage’ is a good thing, and not something we plan to ingest. It’s also an essential high school thing – and not to be confused with, say, ‘artificial means’ or ‘trick training’, a bad thing – at least in the context of academic equitation). In a high school equitation context, ‘artificial carriage'(read: learned or trained carriage) is the proper self-carriage developed to accommodate ready mobility and (therefore) ready collection and mobility under saddle. While the ramener (a ‘head set’ comprised, ultimately, of a vertically arched neck, high poll, and roughly vertical face) of historical manege and modern dressage is not the same thing as artificial carriage, it is a feature, and therefore implicit. A forerunner of today’s American colonial-type “Western” horse: a good trail horse, upgradable to basic stock work, but neck-reining and stock gear are all he’ll ever have in common with the ‘reined’ or ‘bridle horse’ proper. Such a decline could only have occurred as the result of we New World settlers primarily using stock horses to work and drive comparatively docile, hungry, dehydrated beef cattle long miles to market, versus tempting fate daily among the blackest, meanest, man-killingest demons time and selective breeding can mold – at least without igniting prematurely in utero (that mean). A Proper Bridle Horse: Note the ‘Spanish Arch’, equilibrium, and proper collection as he enters a spin. This product of meticulous, expert training (by Jeff Sanders) is hot-swappable with a properly schooled manage or ‘French’-style dressage horse. It should be self-evident that co-mingling with bovines which aren’t trying to kill you (and your horse) is an altogether different day at the office than working ones that are – and thus the vast difference between schools of equitation remaining close to the Iberian heritage and mission, and its more genial, recreational descendants, such as American “Western” style equitation. 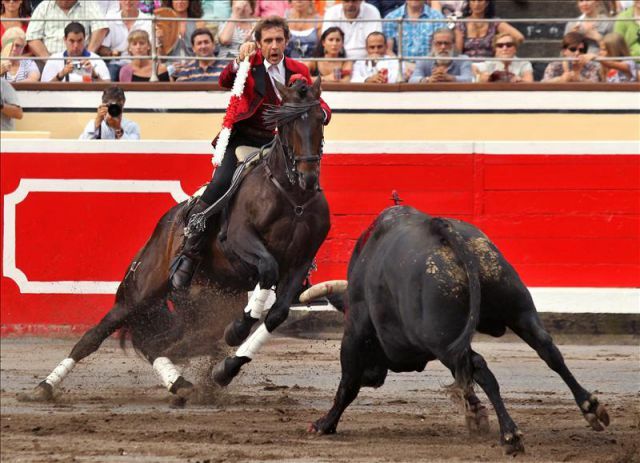 It also explains similarities between the methods used to develop the academic manege or high school horse, and the methods used to develop the bullfighter. COWBOY UP? Pablo Hermoso again: Alas, what the grandfather of all Buckaroo looks like in training (in the ‘other’ two-rein rig). And it looks like what it is: a manege horse Cavendish, Baucher, and Oliveira would have been proud and right-at-home riding. The former is a direct evolution of mounted, man-to-man combat (the mounted duel), and the latter equitation remains for mounted man-to-beast combat. The essential characteristics required for survival are more or less identical, though I think it is safe to presume, as terrifying as a killer bull may be, he still leaves more room for error than a smarter killer man on a faster killer horse, bearing far more lethal weapons (longer, sharper ‘horns’). In any event, necessity being the mother of invention, it is fair to say the methods and disciplines remaining closest to the origins of high horsemanship direct us toward, not only the most legitimate basis for our objectives and standards, but also the most pragmatic means of achieving them. Moreover, it is clear – if it even needs to be said – that the increasingly arbitrary standards of du jour, recreational competition have been somewhat destructive to the fundamentals of legitimate classical horsemanship.